Bangladesh PM Wins 3rd Term After Violent Election, Accusations Of Rigging Prime Minister Sheikh Hasina and her ruling alliance handily won Sunday's general election, and at least 17 people were killed during voting. The main opposition party rejects the results. 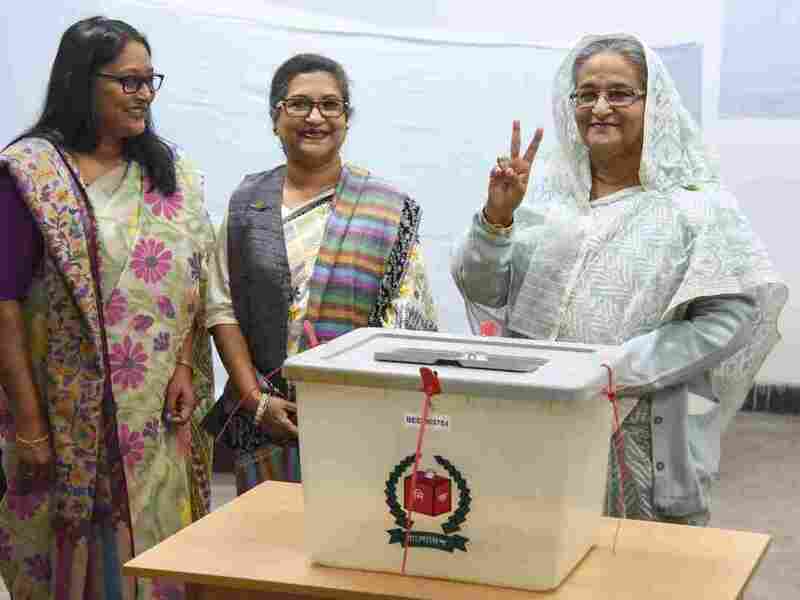 Bangladeshi Prime Minister Sheikh Hasina flashes the victory symbol after casting her vote, as her daughter Saima Wazed Hossain (far left) and her sister Sheikh Rehana look on. Prime Minister Sheikh Hasina and her ruling alliance have secured another term in power following Bangladesh's general election Sunday, during which the military was deployed and almost 20 people were killed. The results, announced Monday by the Bangladesh Election Commission, have been rejected by the main opposition party, which accuses Hasina's party of rigging the election, according to the Associated Press. On Monday, Hasina said her government tried to ensure a free election and that the opposition lost because it lacked leadership, Reuters reports. The United Nations in a statement issued Monday said it was aware of the violence and "reports of irregularities" in the elections. "We call on all sides to exercise restraint and ensure a peaceful post electoral environment, where people can maintain their right to assembly and expression," a U.N. spokesman said. "We encourage the parties to address electoral complaints in a peaceful manner and through legal means. Violence and attacks on people and property are not acceptable." Hasina, who has been in office since 2009, is credited with almost a decade of continued GDP growth in Bangladesh as well as the development of a roughly $30 billion garment export industry, second-largest only to China. She also has been applauded for her handling of the Rohingya refugee crisis, reports Al Jazeera. Her ruling Awami League alliance won 288 of the 300 parliamentary seats up for grabs during Sunday's election, AP reports. Joyeeta Bhattacharjee, a senior fellow at the Observer Research Foundation, a think tank based in New Delhi, says Hasina's development-centered pitch helped her win re-election. She told NPR the country's improving economy "has boosted the morale of the people like anything." For common people, especially in an impoverished country like Bangladesh, Bhattacharjee says, everyday issues such as economic growth and development are more important than human rights violations and cracking down on free speech. The main opposition Bangladesh Nationalist Party has accused Hasina's decade-long rule of becoming increasingly authoritarian, according to AP. The lead-up to this weekend's election saw a widespread crackdown on dissent and the media. Hasina's opponents also complained that they were unable to campaign freely because of intimidation, allegations the ruling party denies. Hasina's administration also drew flak for the arrest of a prominent Bangladeshi photographer Shahidul Alam. And her political rival, former Prime Minister Khaleda Zia, has been imprisoned since February after being sentenced to five years for alleged corruption and was ineligible to mount her own campaign, reports Voice of America. These concerns prompted the U.S. to send election monitors, according to Reuters. During Sunday's vote, at least 17 people were killed, despite some 600,000 security forces being deployed to contain any violence, police tell the news agency. Opposition alliance leader Kamal Hossain called Sunday's vote "flawed" and he called for a new vote under a neutral administration "as soon as possible," according to Reuters. His party won just seven parliamentary seats, AP reports. "We've had bad elections in the past but I must say that it is unprecedented how bad this particular election was," Hossain told Reuters. He said candidates witnessed ballot-stuffing, vote-rigging and the barring of opposition polling agents from voting centers by ruling party activists. The Election Commission will investigate the allegations, which the ruling party deny. The last time Bangladesh went to the polls in 2014, the BNP boycotted the election, more than half the parliamentary seats went uncontested and violence left at least 18 people dead.